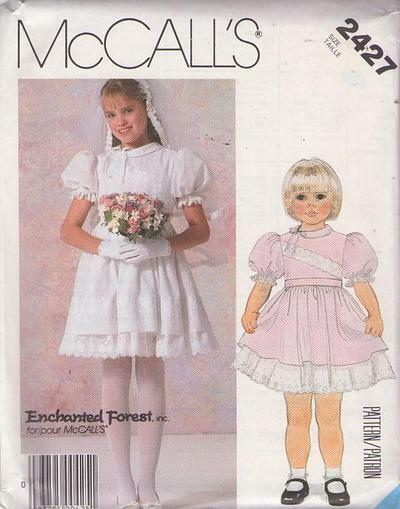 1986, 80s Designer, Retro Fancy Church Clothing Patterns - CHILDREN'S AND GIRLS' DRESS AND VEIL: Pullover dress has lined bodice with buttoned back opening, two-piece collar with piping trim, ribbon bow, gathered skirt, front waistband with tie belts and short puff sleeves with elastic in casings; attached half-slip, longer than dress, has lace or eyelet trim at hemline. Bodice front and sleeves have lace or eyelet trim, but it is optional for skirt. Tulle veil has lace trim at edges and is attached to purchased headband.